Now that spring is upon us, it’s time to start “greening” your diet! 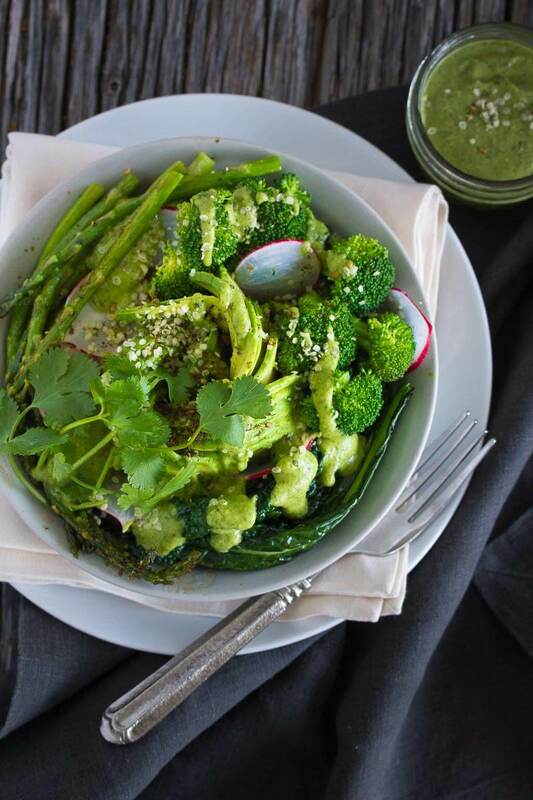 Green Goddess is a funny name-but it was a typical dressing in the 70’s and 80’s for healthy, California style salads! Sprouts, veggies, and a creamy, herby dressing! Too healthy, right? Is there such a thing? Here, I’ve taken my inspiration from the name, but have re-imagined it as a bowl. 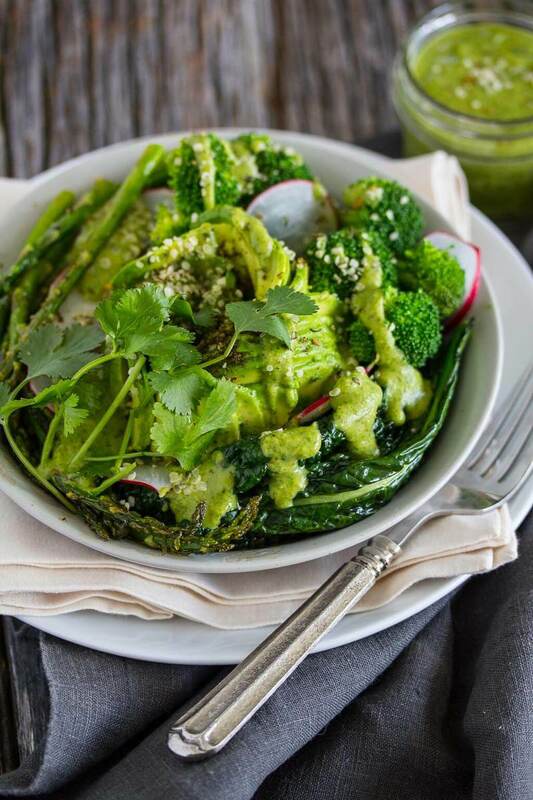 This bowl is in the spirit of spring cleaning-getting your greens supercharges your body with nutrients, helps to detoxify, boosts your immune system, and cleanses your colon with plenty of healthy fiber. Bowls are a great option for easy weeknight suppers, or quick healthy lunches. You can prep everything you need for a week full of healthy meals by cooking a big pot of quinoa, making your hummus, and steaming or roasting your favorite veggies. I’ve been dipping into this week’s hummus as a snack with chips all week. The greens we’re focusing on here are kale, asparagus and broccoli. Oh, and there’s a hint of radish in there for color. There’s a lovely creamy green hummus on top, made from white beans and spinach. Avocado gives a nice serving of healthy, creamy plant based fats to keep you satisfied for hours. And did I mention it’s just in time for Saint Patrick’s Day?? Bring a small pot of water to boil and submerge the spinach in the boiling water for about 30 seconds. Remove from the water and set aside. Save the water to steam your broccoli. Place the blanched spinach, white beans, garlic, lemon zest, lemon juice, olive oil, salt, black pepper and smoked paprika in a food processor. Puree until smooth. Set aside until ready to use. Cut the avocado in half and slice lengthwise. Set aside until building the bowls. Using the same boiling water that you blanched the spinach, place the broccoli florets in a colander over the simmering water and cover with a lid. Steam until florets are tender, about 5-7 minutes. In a skillet, heat the tablespoon of oil over medium heat. Add the asparagus spears to the skillet and cook until just browned and barely tender! In the last 3 minutes of cooking add the kale to the pan and cook until the greens have wilted. Heat the cooked quinoa and place in 2 bowls. 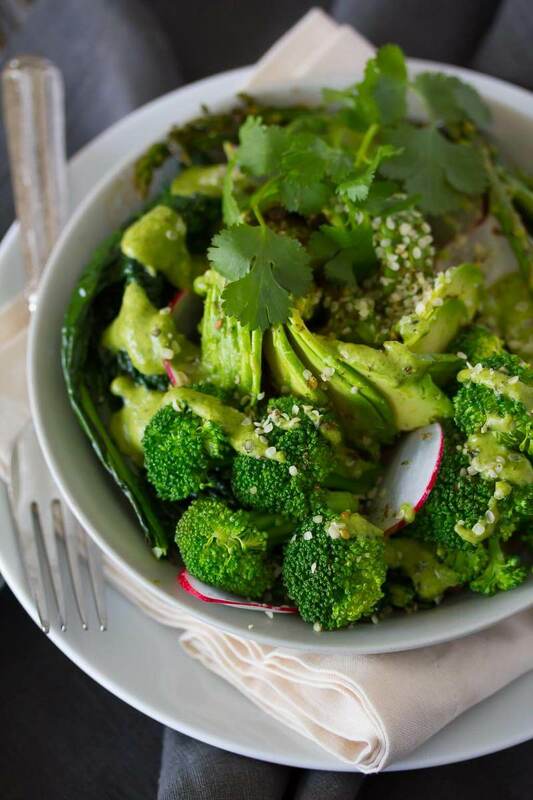 Place ½ of the avocado in each bowl, as well as half the broccoli, and asparagus and kale. Place a generous dollop of the green hummus in each bowl. Garnish each bowl with radish, cilantro, and za'atar.